The second episode in our membership site series, exploring why we should be thinking differently about membership sites, and highlighting the tools to help you build a more dynamic, powerful community around your content. 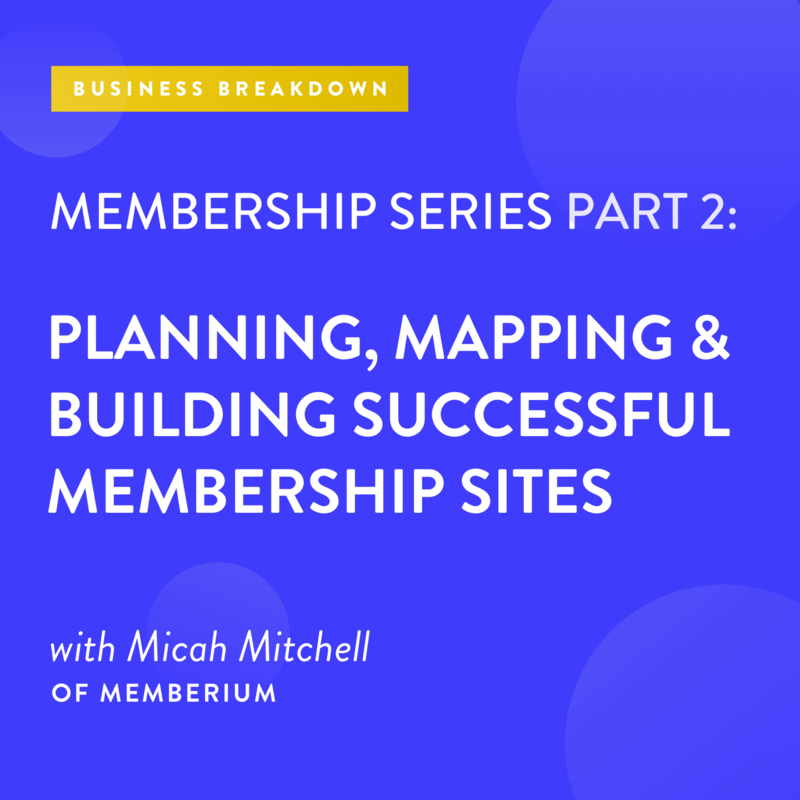 Memberium CEO Micah Mitchell has a decade of experience behind him helping business owners and marketers learn how to build successful membership sites. In conversation with Chris Davis, he reveals his best practices for creating strong, trust-based membership sites that grow a community around your business. Find Micah online and learn more about Memberium at ActiveCampaign.Memberium.com. Chris Davis: Welcome to another episode of the ActiveCampaign podcast. This is part two [00:00:30] of our three part membership series. In the first part we talked about the next generation membership sites, going beyond just membership levels and in tools that gave access, silver, gold and bronze type, and move to a more dynamic set up with using lists and tags to be able to dynamically set not only membership levels but access to content. To keep things like I mentioned before there is really, when it comes [00:01:00] to building a membership site with ActiveCampaign there’s really three names that keep popping up. I wanted to take this time to bring on one of the most frequently asked about names and that’s a platform called Memberium. Today I have with me Micah Mitchell from Memberium. Micah, how are you doing? Micah Mitchell: I am doing great and I’m happy to be here. Thanks Chris. Chris Davis: I’m [00:01:30] excited to have you on. Micah, what is your official title there at Memberium? Micah Mitchell: Probably CEO. We don’t use titles enough but that’s what I use when I need to. Chris Davis: Yep, yep yeah, sounds similar to us here. It’s funny because like when I do the onboarding I do all the internal when we hire new people I give them the presentation and the overview of the company and everything. I say, you know what this is probably the first and only time you’ll hear me refer to myself as the director of education. [00:02:00] You know otherwise it’s just Chris. It sounds like you all have a similar culture. Micah, just tell us for those who perhaps didn’t catch the previous podcast episode, this is their first one coming in what is Memberium? Micah Mitchell: Memberium is a plug in will allow you to tie your active campaign account to your WordPress membership site and control access to content, you know control how your users [00:02:30] view and consume your content based on their profile and ActiveCampaign. Based on whether or not they have certain tags or they’re on certain lists you can block access to pages on your WordPress site. People use it a lot to create membership sites, either where they’re selling content or a lot of companies use the membership site as a lead magnet or a value ad for people who are buying other things from them. It’s basically to control the experience on your website using the data from ActiveCampaign. Chris Davis: Yeah [00:03:00] and I’m glad you brought up using it as a lead magnet because a lot of people don’t even put that together. Right? Sometimes you get so focused on PDF downloads and info graphics and maybe video series that you don’t realize you can give access to a membership site for free without going through the payment or the checkout process. Micah Mitchell: Yeah exactly and there’s a lot of benefits to that. You kind of get them to log in, you know take a little [00:03:30] actions and you can show them different things once they’re in that are customized like, hey welcome back Chris. Hope you’re enjoying this. Here’s this other stuff. It is a lot better than like you were saying just the PDF download and some of those things. Chris Davis: Yeah absolutely. I believe I think it was episode 21 we had Curt Duplasis on. He had a free membership site, and his whole goal was to get you to set up right. Get you to sign in with your membership site [00:04:00] so you could start using ActiveCampaign site tracking. He can start seeing what pages and modules you’re completing, so he knew what offer to put in front of you. It was highly effective for him. Micah Mitchell: Yeah super smart. Chris Davis: Yep, yep. Micah, tell me this, Memberium, where did Memberium come from? Before you answer, I remember back in the day I won’t put the date on there because I’ll let you do that, but back in the day [00:04:30] I was getting certified. Matter of fact, that was long ago it was, I was getting certified in Infusionsoft and right when we were ending we were going over like third party tools and Memberium came up. Everybody joked, they were like, that sounds like a chemical, like an element on the periodic table. You know Memberium. We always … We just kind of chuckled but since then it just seems like you guys have really taken off and built some momentum. What [00:05:00] was the inception of Memberium? Micah Mitchell: I’ll be honest, the name came from one of those domain name generators. My co-founder Dave Bullock was looking for stuff with membership and he picked that. When we first got started he was like, and we’re going to have to change the name. I was like no, no, no I love the name. It’s been funny because people like especially international clients have had trouble pronouncing it, you know. There’s probably ten ways to say it and I know that, that’s supposed to be [00:05:30] a branding no, no but we kind of joke about it. We think it’s funny. You know the concept was basically like you’re saying the periodic table of elements it’s everything to do with membership. We’re like membership at it’s core and all the attributes of membership are built into it. Chris Davis: Nice. Got you. Where did the idea come from? I mean, was it a paying point in your personal business? You’re like man I just wish I had more control over my membership site? Can you kind of speak to the [00:06:00] genesis of the idea of even implementing such membership site? Micah Mitchell: Yeah it was kind of interesting because I’ve been doing membership sites for a long time myself in different ways with different platforms. There came a point where there was a solution and at the time we were using a product called Infusionsoft so there was a solution to tie Infusionsoft to a WordPress site but there were some issues with it with scalability and security. [00:06:30] Also, support and things like that so when we started it, it wasn’t so much like let’s bring all the newest latest and greatest technology, it was like let’s have a solid piece of technology but surround it with all the other stuff like the support and the learning and everything to help a small business owner actually be successful with a membership site, not just technically connect but actually be successful. To us it was a lot of ease of use within the plugin but also ease of use in if you have an issue support [00:07:00] is going to help you. You know we’ve built in templates to it, we have a lot of training where we interview other successful users. We kind of see it holistically and it has grown technologically to where some of the biggest marketers out there use it because of the advantages of the technology but we really focus on can my grandma get a site built with this? We talk about that a lot internally. When customers talk to us you know treat them like they’re a family [00:07:30] member, one that you actually like. How would you help them, right? If they’re not technically inclined. We have a lot of focus on the soft aspects of it, I guess. Chris Davis: Yeah. You know what, I want to highlight that because those are things that are often overload, right? We’re in a society of immediacy. It’s like look, if I put in a support ticket and ten minutes go by and I don’t hear anything I’m going to Twitter right? Somebody doesn’t reply I’m going to Facebook. [00:08:00] Support has become like the unsung hero in sales product. He who or they that supply the most effective or the most efficient support often times we’ll win. It’s refreshing to hear that you said hey look, you know there’s stuff out there but look at what it’s lacking. It’s lacking the support and it’s lacking the education. To bring that to [00:08:30] the space hats off because I will admit your platform is before I was using this type of membership site your platform was where I got most of my education from. You know you have showcases on your website where you can just kind of see who all is using it but you also have … You mentioned it but you have these user videos or these case study videos where you go and do a deep dive [00:09:00] on their membership site and they log in and they show you how things are functioning. For me it helped connect the dots because what I found is that it’s not always easy to understand what’s going on with the membership site, especially when you’re using the next generation type membership sites like Memberium where just applying a tag to a content record can open up an entire different path to their journey within the site. Micah Mitchell: [00:09:30] Yeah and those case studies are really fun. I was kind of surprised when we did the first wind how willing they were to share about what their doing as the membership site owner that’s making them successful. We would go into the technical and we’d say like okay, this looks awesome. I can tell why your members love it. How did you build that? What plugins did you use? Did it require a custom code? I love that they were willing to just kind of open and share it. Like I said, the first time I was surprised and now I’m not as surprised because it’s a consistent experience [00:10:00] where everyone we interview they’re just happy to share it. The thing I love about it is I get to learn along the way too they’re usually better marketers than I am and they’ve got all these cool creative ideas. I love that they’re able to get them done but again some of the soft things they share, like okay what do you want to do when someone wants to cancel? One of our clients, for example, has a really cool process of when they cancel a video comes up and the owner of the site kind of reminds them of why they joined and all the benefits. They can still cancel if they want. Micah Mitchell: They save a ton [00:10:30] of them so all these strategies and then they show like okay here’s the little bits of technology I used but here’s the thought process. Right? The strategy behind it, I just love learning that. Chris Davis: Yeah. I agree. One site that comes to mind in particular, I believe it was like mmmastery.com or whatnot. It was the first time I had gone to a website and really had witnessed first hand like the free membership site [00:11:00] and then the unlocking of free content. The LMS approach and I was just like oh my gosh. At that time it was magic to me. I couldn’t wrap my head. There were so many things happening. I just put in my name and email and then I get log in access? Then I believe I was auto logged in at that. You know so for someone coming from a platform the old generation membership sites of like digital access pass or wishlist member or member mouse. Things of that nature. [00:11:30] Somebody coming from that approach to this it just boggled my mind. I was like how is this possible? When I started watching some of those videos and you’re right, people were so excited just to share. Like look. Look at how it’s working for me. It really helped insight the fire in me to say you know what, that’s what I want to do. You know that’s the next step for me. Specific to Memberium you all have a membership summit [00:12:00] and I haven’t had the opportunity to attend one yet but I’ve talked to many people who have attended one. Micah, give us an example or I should say, explain in so many words your framework. The framework in sense of index cards. That’s all I hear from people when they came out, it’s either post it notes or index cards. They’re like, I finally get it. Micah walked us through index cards and post it notes [00:12:30] and how you get out of bill my membership site. What is this exercise that people are so excited about when they leave the summit? Micah Mitchell: That’s funny. Yeah the summit is all about membership sites but we usually start out with this really old school exercise where we give them each a stack of three by five cards and I kind of … It’s funny because there are some people in the group who have trouble with this and so it takes some coaching to get them to go along with the exercise. [00:13:00] Most people just eat it up but yeah hands down when people get it they love it because it’s so tactical to have index cards. So many people are like I’m going to design a membership site so I need to go make a mind map on my computer and I need to use all this technology. Basically we say okay here’s your index cards, I want you to take three of them out and I want you to split up. Take the width and breadth of your content and split it up onto three index cards. What would they be called? Is it beginner, [00:13:30] immediate, advanced? Is it … One lady, she does different veterinarian therapies. Is it like large animal, small animal, specialty animals? You can split it up however you want. For the example I gave too is like for a marketing company that could split it up into leads and sales and delivery. Then what you do is you just drill down your [inaudible 00:13:51]. Say okay you got those three cards, now for each of those split that up into three categories. What are the three categories of leads? Maybe traffic, the capture, [00:14:00] the nurturer or something. Then for each of those you split up into three okay within traffic what are the there? Maybe it’s paid or organic social. Then within each of those split it up. The idea is when you split up all these cards you can put them … First of all you can lay them all out. As the business owner you can lay those card’s out and kind of see your content organization. What’s nice about it is you can just move stuff around. If you don’t like a card you can crumple it up and throw it away. You can write notes about the content on those cards. I’ll share this, and I’ve never done in this in an [00:14:30] audio only version, but if you imagine like a rug. Like a really nice rug, you know great design on it, that’s the how the business owner sees their content is they see the whole rug. They can appreciate the grandeur of it and the design and where things fit together but the user doesn’t see that. The thing we talk about it is the bug in the rug. It’s kind of like okay the human sees the rug but the bug in the rug what do they see? They just see walls of fiber around them. They have no idea. That’s your member. [00:15:00] If you imagine index cards spread out over a table and then if you stack them all together into a single stack, like a deck of cards that’s what your user sees is one card at a time. You start shuffling through the cards and you pretty quickly see, okay if I start at the top and I shuffle through and I get into the mindset of a new user what am I missing? Okay immediately it’s like, well I need a welcome video right at the top to tell them what’s about to happen. Then as you go through you start to see okay between this section and that section I need a transition or these two are out of order, [00:15:30] they need this before they need that. You shuffle through them until you fill in any gaps. You get them in the right order and then you start to get a little more on the emotional side and you say okay how are they feeling at these different points in the content? Once you’ve gone through this and you can kind of you know picture your content all laid out. I won’t go too far into it but basically I like accidentally came on this process because I would go walking around by the river in Colorado where I lived, the Arkansas River headwaters are there [00:16:00] in Colorado. I’d like spread them out on the ground and then put them in my pocket. Then I was on planes and I couldn’t spread them out so I just flip through them and I started to realize like oh yeah there’s a lot here. Then I’d re-spread them out when I got a chance. [crosstalk 00:16:14] big and small and big and small you get your content right and you get it to flow. Then when you put that into a membership site yeah you still use best practices but it’s not like you’re having to jump through a bunch of hoops and do a million things to get them to consume the content. They just like what [00:16:30] they’re seeing, it’s a smooth process. They get the information, they get the results. That’s kind of it in a nutshell. Chris Davis: Yeah I love it because it’s the same thing. It’s a very similar thing that we teach here. I’m always teaching and encouraging our users is I get it. We’ve got an easy automation builder, the tool is easy to jump in and start clicking buttons and building stuff. The time that you take to work through all of the issues in the analog will only [00:17:00] make the movement to the digital more effective. You know so wrestle with it with pen and paper, wrestle with your idea with the white board or something. Map it out. Get clear on exactly what you want to do and then once you have, once you are clear on it then move to the digital and start building it out. For you, I mean just being able to carry … It’s essentially like you’re carrying your membership IP in your pocket. Wherever you go [00:17:30] there is no, no charger needed, right? There’s no electronics needed, no wifi needed. At any point you can pull them out and work on it. Micah Mitchell: Yeah. If you … Like, when inspiration hits, which isn’t always when you’re at your computer. You can just pull out a card and jot it down. I wanted to mention the one other like little hidden gem for membership site owners is a lot of people would make a long video, so like I said lead generation. A lot of people might make a 30 [00:18:00] minute video about lead generation but by forcing people to take every card and break it down three times again you end up with these little tight succinct subjects and then those become your videos. Having more videos with gamification is a huge advantage because then you can give people little rewards more often so they have this perceived sense of progress and whatnot as they’re going through their site. It also optimizes it for mobile, because our mobile people want shorter chunks of content. Micah Mitchell: Instead of them [00:18:30] watching a 30 minute video and losing track of where they’re at it’s like no, there’s ten three minute videos on just the subjects you want so you can skip around. There’s some other benefits but yeah I agree. Building automation even in something as simple and easy to use as ActiveCampaign if you just dive right into it you get half way through and you’re like okay now why did I do this? What do I need? It’s so easy. Chris Davis: Right. This is like I said, your platform is the leader in education when it comes to membership [00:19:00] sites. Before you even had the software you were doing membership sites. It’s just kind of interwoven with the fabrics of Micah. I can imagine you sitting down with a business owner saying they want to start a membership site is just like all muscle memory at this point. It’s like okay well let’s grab the cards, let’s do this. You know before you realize it you’re like oh there you go, there’s your membership site. It seems so easy because you’ve done it so many times. In that vein, what [00:19:30] would you say is the DNA of a successful membership site? Micah Mitchell: I’d say it starts first and foremost with the person who’s teaching or the company who’s providing the content being the expert. This came up a couple weeks ago, we’re actually developing a membership program to teach people how to build membership sites and they were like oh should we include a module about how to pick your niche? It kind of pissed me off and I was like, if they don’t know [00:20:00] what their niche is they shouldn’t be building a membership site. This isn’t get rich quick like I don’t know anything about this but I’ll just throw some content together and sell it. Because again, that’s where they’re going to have jump through a million hoops and they’re going to have to make unrealistic marketing promises and do all this stuff to get people to buy it and make money but it’s … I don’t mean to offend anyone who is doing this kind of like niche mining but it’s just no, a membership site, a really good one, is where the owner really [00:20:30] does care and really knows their stuff. Then the format is like an afterthought. The format is still important. Adding some gamification, you can do a certifications and badges and all sorts of fun stuff. The content really has to be right and the intention has to be right. You know what I mean? Chris Davis: Yeah, yeah. I get it. That is a great point because I know we have this thing, Micah, and I know you know it all too well. With technology [00:21:00] being so easily accessible and so easy to use often times you get ideas, and they get abused. Since a membership site, or a membership script costs anywhere from 100 to 300 bucks. I mean, anybody with a decent business and or idea can get their hands on the scripts, so they’re just thinking like oh I’m going to build this membership site for this specific niche and get rich. You know. [00:21:30] It’s refreshing to hear because we take the standpoint at ActiveCampaign of teaching people responsible marketing. Don’t just blast and spray and pray, and you know just keep your fingers crossed, I hope it works. Take the time and set that expectation. Be clear in your messaging and if you’re not going to do that then we’re not the platform for you. For you to say, look, you know I’ve got to draw the line here. You have to know what you’re doing. You have to be a subject [00:22:00] matter expert in something before you should even contemplate building out a membership site. Because it’s essentially is your process captured. Your process laid out and gated by a user name and password. Micah Mitchell: Yeah exactly. I should also add like when people talk about memberships some people think a course, like a one time fee and some people think a subscription like an ongoing monthly. [00:22:30] You might be able to get away with making a course, not being the expert. To keep a monthly subscriber or a group of monthly subscribers like Dan Kennedy calls them a herd. To have people kind of follow you and continue to pay you really do have to be good. I mean you’ve got to be hitting on all fronts and keeping up with the market. Yeah in order to do it right I do feel and it’s maybe my own personal … Like, I’ll get off my stump in a minute but yeah I feel like to [00:23:00] keep up with your audience and for them to like you long term, which is to me where it makes the most business sense as well is to have that customer for a long time, yeah you do have to be that subject matter and expert and yeah I love with ActiveCampaign … it was funny, I’ll go on a tangent. You guys shut down my campaigns the other day when I was creating tutorials and I was like what is this? Micah Mitchell: When I worked through support they said, well you’ve got all this test content in there and that could damage our deliverability. Because I’m just putting like test, test test in my [00:23:30] stuff. Chris Davis: Oh, got you. Micah Mitchell: At first, I was like, you know how dare you shut down my campaigns. Then I was like, oh that’s really smart. Yeah no problem I’ll have better content from there. Chris Davis: Right, right. No it is … I think now is a time where it’s needed more than ever to really train people properly on how to use the technology. I don’t … Micah, you got off of your stool, now I’ll [00:24:00] get on mine. This is something that’s near and dear to my heart of course being the director of education is that too many companies have just looked at education as an oversight or the step child. Like yeah, they’re part of the family but they go and eat over there in the corner. You know, they don’t sit at the table with us. It’s like, no. People have to be trained. They have to be educated on how to use these platforms the right way because there are a lot of times where people [00:24:30] are not trying to get over or abuse the system but because they’ve never been properly trained that’s what it ends up being. They end up getting scarred by technology and less prone to adapt software that could really help them because of just their not knowing or ignorance in using a particular tool. Micah Mitchell: No that’s a really good point. In fact, we … It’s funny to me. We do office hours and some different things and it’s funny how often … [00:25:00] My partner Dave is really good at this. Someone will ask a question and he’ll be like, you know they’ll ask a question about a feature, like a technical question. He’ll kind of come back with, well tell me what you’re trying to do, like why do you want to use it that way or why do you want to use. They’ll explain it to him and you know maybe more than half the time he’ll be like oh okay well a better way to do that is actually not even that feature basically. It’s really … I’m surprised how unsophisticated [00:25:30] most of the users are, even though they are using technology which could be seen as somewhat complicated, they’re trying to figure it out. We take the approach of, they shouldn’t have to learn all this tech to make a membership site so we try to add in templates and make it easy. It is interesting. Like you said, scarred by technology where that’s what we’re trying to avoid and it’s hard too because you feel like you’re doing a good job adding features and adding documentation. Then it’s [00:26:00] heartbreaking to run into somebody who’s like well I tried all this stuff because I saw this feature and it’s like aw man I wish I would have talked to you a couple of weeks ago, saved you some time. Chris Davis: Yeah. Yep, yep. No, I get it. You know you mentioned things like gamification and courses. Is there any particular strategy, we’ll say, or tactic that you’re seeing that’s working really well with membership sites now? Micah Mitchell: Yeah. Let me [00:26:30] kind of explain general gamification and then yeah I’ll dive into that. For those of you who don’t know what we mean there, it’s basically making the learning experience kind of seem a little bit like a video game. It’s like oh if you complete this little quest you get some coins or a prize or whatever kind of a thing. To bring that into business terms a lot of sites are doing well by selling a certification. The membership site is gamified, instead of just coming and watch these 100 videos and we [00:27:00] don’t really care what order you watch them in or when you watch them or any of that you can have a membership site with 100 videos that’s like hey, you know the rest of the videos don’t unlock until you complete the onboarding. That’s really going to make your experience better. The onboarding is split into these little chunks where every time you complete one it’s like, congratulations you’re 11% of the way there. You just earned 10 points. Great job on finishing five modules in three days, you’re in our top 10% of customers. Keep going. You know, you’re going to love it. Kind of some [00:27:30] encouragement, making them feel like they’re getting some wins early and some kind of quick and consistent wins and then in bigger chunks you might take those 100 videos say, well this is really maybe five sections. Every time they complete a section they get a badge. Instead of like we’ll take something broad that hopefully everyone can kind of grasp. Let’s say internet marketing, they’ll say instead of like you have to do all 100 and then we say good job you passed the internet marketing course it’s like hey [00:28:00] you completed the first section. You’re now an email marketing specialist. Congratulations. You’re an expert in email marketing. That win basically is going to make them want to become an expert in the next section. It’s like points and badges and stuff. At the end of the day though this is a huge value to many, many industries, if you can position your course as a certification course. Instead of just, hey take our course you’re going to learn stuff. It’s, take our course and I take the little [00:28:30] test or quiz or whatever and you can become certified in this thing. For professionals that’s valuable obviously because then they can use that certification on their profiles. Even for non-professionals if you position your course that way they’re going to see it as more legitimate, like more thought and effort went into this course because it’s a certification course. It gives them kind of a bar to measure themselves against. You know they don’t necessarily have to certify but it increases the perceived value of the course and then if they do certify [00:29:00] it actually does increase the value after they took the course because now not just, I took a course, but I’m certified in something. That’s going to come in handy down the road presumably, it’s the same reason people go for college degrees and things like that. There’s like the experience part of it where you’re gamifying it and stuff. Then there’s the badges and the certifications and so forth but they’re actually useful to most industries users. Chris Davis: Got you. [00:29:30] You know what, you know what Micah, while you were saying that I remembered something. Back … Wow let me not date myself. Well, maybe seven years ago. Oh wow time flies. Seven years ago when I was an engineer at [Lackey 00:29:45] Martin and you know you’d go there and it was just boring. I’m not going to sugar coat. It was boring, it was one of the most boring jobs I ever had because it just was. You would find yourself with a little free time [00:30:00] and in that free time what was big was learning a specific thing. If you wanted to learn something specific online you found yourself in forums. Right? You would go to these forums and search and find answers and right under the user name they would have stars. Right? They would have like a status, they were either staff or they were like an all star. It was all set on how many threads you [00:30:30] replied to or how many questions you asked. Then you could see there was kind of the online reputation in that particular forum if you had like five stars. You’re like, oh listen to him if he answers this question it must be right or if they answer the question it must be right. That’s what I thought of today because I would have never even know that type of gamification was possible. [00:31:00] I was just a participant at the time but now to come to today’s age with technology using a platform like Memberium like you said you can give badges and give different levels for tiers. Excuse me. I feel like that’s what everybody is used to now. Games are you know like actual video games. I know one of the ones my son loves to play at my brother is Call to Duty and they got classes. [00:31:30] Different classes of guns and soldiers. You literally play that game to up level. Right? Like level up. Chris Davis: To bring that into the business world it’s amazing and it does, it encourages engagement, it gives them that virtual pat on the back and say, hey keep going. You’ve got this far, you’ve got two badges. Don’t stop, there’s three more. You know. [00:32:00] That’s really cool. Is that the main thing that you’re seeing that really help build strong membership sites? Micah Mitchell: I think there’s a lot of that and there’s also a lot of community and they mix together. That’s funny because I didn’t think of the forum thing but now that you mention it’s like yeah that’s exactly what I remember too. How those things worked is you know you got your power users and the people you trust, basically. There’s something that denotes trust. Nowadays the people [00:32:30] who are really successful are building tribes around their subject matter. Part of that tribe building is having your power users and separating them from the other users. Having some digital marketers is a great example where they have digital marketers certified partners. Those are people that you can trust because you know they’ve been through at least a certain amount of content and gone though the exercises or whatever it is. Those partners are part of their community, meaning they support the community effort. [00:33:00] If you go into a digital marketer Facebook group for example, it’s not Ryan Deiss. Those of you not familiar Ryan Deiss is kind of the owner and the main guy. He’s not in there interacting with every single member, it’s his certified partners. It builds that scale and on the community aspect there’s so many things, I’ll just try to touch on a couple of them. We talk about, I won’t go too deep into this, but we talk about different stages of memberships sites at the membership summit and basically how a lot of people who struggle with a membership site [00:33:30] it’s because they don’t understand the stage they’re in so they’re trying to implement the wrong strategy. A good example is some people will start a membership site and from day one think oh I need a big community with my membership site for it to sell but the problem is you don’t have any members yet to be in the community, right? There’s no interaction. We kind of suggest building a community when you’re a little bit bigger. A couple of strategies like shortcut things for that, that I’ve seen people do successfully even with small communities, there’s’ this one where they had like [00:34:00] 70 people. I went in and they were all interacting in that all day every day, even when I was watching doing this case study people were chiming in their community. I’m like what is happening? This does not seem right. The lady, who was taking me through the case study she was kind of on the technical and she said, well my husband, he’s a subject matter expert, he committed himself to doing 100 days in the community off the bat himself. He kind of jump started the community through his own effort of sharing a piece of content every day [00:34:30] and then asking people for feedback and thoughts and like spurring the discussion. I thought that was a cool way to get it going. Micah Mitchell: Another one is I have a friend in Australia who started a new membership site and it’s funny because he’s like super big time now. I mean, he’s always been amazing but starting to really get up there. What he did that I thought was really clever is his pricing was going to be something like 30 or 40 bucks a month and he said, but you know I’m going to make a one time offer [00:35:00] to my list to buy it for a one time fee of $30, or 40. I can’t remember. Basically whatever the monthly fee was he offered it as a lifetime fee. I thought, well that seems kind of crazy. Why are you doing that? He said, well basically I want to front load my community with all those people who are going to love me and they’re never going to leave. Why would they leave? They’re not paying, like they’re never going to cancel. He got all these lifetime members of a whole trunk of them in right from day one to kick the community off and then when he did his actual launch the community [00:35:30] was a big selling point in his launch saying hey, there’s already hundreds of members in here and I actually think it was in the thousands, interacting and helping each other every single day and you get access to that along with all the training. Community is the other piece. There’s a couple of tie in’s between like the gamification and the community and the certifications and things like that but that’s the other big thing. You mentioned one of our case studies I think maybe before we jumped on which is the WP Elevation one. [00:36:00] In that case study he has some cool features where he’s using them, bury them in some custom code for example to represent all of the members in his community on a map. You can go to a page and there’s like a world map and all the members are shown on there. You can actually zoom in and see how many members are in an area and click on them and message them. That, for somebody to feel part of not just like hey I’m getting this content from this guru type, but hey so is everyone else. Like there is social proof and [00:36:30] I can lean on my fellow community members who maybe at the same stage as I am or a few stages ahead. The value there is huge. That’s a longer term play but community is the other big thing. Like I said, there’s ways to mix them together but if I had to pick a second, definitely would be community. Chris Davis: Yeah I’m glad you brought that up because it speaks to successful membership sites being the focus not being on the creator. Right? If you want to build that herd, [00:37:00] that tribe, that community, take the focus off of you and build it in a way where people will love to and easily engage and continue to engage. Right? That seems to be one element to the winning formula with memberships. It’s kind of like the show Cheers. You know you want to go where everybody knows your name. You know. It’s like the virtual version of that. [00:37:30] Right? You get to provide help to others and see them like along their path and eventually they become the ones helping and it’s just like wow. I personally love it. I love that community feel and it brings to the internet, which can be very much abrasive and sometimes impersonal, it brings that personality and community and brotherhood [00:38:00] back to it. You know the good part about it is you can now make money by doing that. Chris Davis: You can get paid for building a community the right way. I know you had mentioned digital marketer, which is probably the biggest digital marketing education website out there. You know they’ve got many certifications, they’ve got a plethora of [00:38:30] training videos that you can go through and seeing them leverage a platform like yours just kind of shows … I always like to tell people if you’re looking at a tool you should put these tools through the utmost scrutiny with what you decide to implement for your business. Right? It’s just like if you were looking for a babysitter you wouldn’t just grab anybody off the streets and say hey can you watch my baby for a couple of hours? Chris Davis: [00:39:00] Why would you go and look online for the first free tool that has a shady website, you can’t even see who the co-founder is. You don’t know any history about them and rely on that to run your business. It’s crazy. It’s ridiculous. It’s good to always get visibility to the team behind the software. What their beliefs are, what drives them so getting to know you [00:39:30] everybody is going to go to Memberium now and see the education. They’ll know exactly why it’s there. They’re going to go to the membership summit and they see because that’s a subset of you. These are things that you’re passionate about so it comes out through the tool and the platform. You just can never know enough when it comes to making an educated decision for such software. When you have big wins like companies like digital [00:40:00] marketer, and that’s not the only big one. I believe Russel Brunson also uses Memberium. I think Infusionsoft uses Memberium internally. You guys have a pretty nice size client list of large clients. Right? Micah Mitchell: Yeah definitely. A lot of the people from the secret, you know [inaudible 00:40:24] and them, Jeff Walker, product launch formula guy. This is what I was going to say, [00:40:30] you know the technology I can downplayed it earlier but there’s a reason that the biggest sites use us and we have a unique technological approach to make sure they can scale as well. It’s not say the text’s not there but we just we almost I don’t want to say take it for granted but it’s like oh yeah we have to make that perfect in order to have these clients but we also have to have all the soft stuff in order to get and help anybody, not just the big guys. Chris Davis: Yeah, yeah. Definitely. Well Micah, I appreciate it. This [00:41:00] has been great. This has been amazing. I enjoyed learning more about Memberium and more specifically about your index cards. The index card approach, to building membership sites. I hope everybody listening can also. There were so many nuggets that you dropped as far as building a successful membership site, even approaching building membership sites and how to map it out. This is definitely going to be a hot episode. I can’t thank you [00:41:30] enough for jumping on and giving us some insight to what you’re working on. In closing, is there anything in the pipe line you’d like to share? Big projects or just a word of encouragement you’d like to leave the listeners with? Micah Mitchell: Yeah I mean so my word of encouragement would be that it’s worth it. On the other side of the technology hurdles, whether or not you’re building a membership site. Even just automating some of your marketing with ActiveCampaign for [00:42:00] example. It’s always like you get sold and you think that’s going to be amazing. Then you get down in the muck and it’s like this isn’t as amazing as it sounded. On the other side of that when you’re done with it’s totally worth it. You know that’s one of the things I enjoy is talking to successful users who they’re not just like oh I did this launch whatever. They’re really telling us things like hey you changed my life, I get to spend more time with my family and all that kind of stuff. I’ll just say it’s worth it. Fight your way through whatever you’re facing and it’s worth [00:42:30] it on the other side. Chris Davis: Great. I agree. It is most definitely worth it. I know it from a personal standpoint. One of the best things I’ve ever done for my personal business is implement a membership site. I agree fully. Again, thank you so much Micah. It was great reconnecting with you, finding more about Memberium and for all of our listeners if you didn’t catch it Memberium and [00:43:00] ActiveCampaign are tightly integrated. In fact, how could I forget? Oh my goodness. Memberium was in like beta phase for ActiveCampaign right? It’s now launched, it’s official. It’s like off the shelf product ready, right? Micah Mitchell: Yeah. We spent a long time working with beta users and get it going and then it’s just last month, like the end of last month where we really launched it so we’re going to start full board adding a lot of things to it and what not [00:43:30] but yeah Memberium for ActiveCampaign is ready to rock. I mean, a full support and they’re adding video tutorials and chasing after it. If you came by earlier and we seemed a little bit behind the game, that was because we were doing a lot of testing internally and on the back end but yeah now it’s ready to go. We’d invite anybody to come and ask questions and see what we can do to help you. Chris Davis: Great. That’s memberium.com everybody. The link will be in the show notes if you’re a little intimidated to try to spell it yourself, you’ll be able to click [00:44:00] on the link M-E-M-B-E-R-I-U-M. Memberium.com, please do check it out. You’ll see the video tutorials. Everything that I mentioned you will see live on their website. With that being said, Micah, appreciate you, thank you and have a good one. Keep fighting. Keep fighting the good fight educating these business users or business owners on technology [00:44:30] and marketing. Micah Mitchell: Yeah, thanks for having me. It was a pleasure. Chris Davis: All right. There’s episode two, or part two in this membership series. If this is your first one, if this is the first podcast you’ve limestone to in the previous episode I introduce the next generation membership site. That’s what Micah was talking about, and we talked to Bob Cane, and he’s a creator of another platform. How he came up with this idea and how it’s migrated. [00:45:00] I shouldn’t say migrated but how it’s merged and morphed since then. What I really loved about this episode was the focus, the intentional focus on support and education. I can’t tell you how valuable that is for any and everybody offering a product. If you are on the fence with using a membership site by now you have two tools that can do everything that [00:45:30] you need and more with a little bit of work, and some guidance that you can find from either company. The next episode you hear will be the third and final tool by the end of this series you’ll be well educated on three tools to use, and I hope it helps in that decision making process to just get started and start reaping the benefits of membership sites. If you’re not subscribed to the podcast please do so. You can go to activecampaign.com/podcast to access every podcast recorded, or [00:46:00] you can subscribe to us in Itunes, Google Play or Stitcher Radio. Those of you who are listeners if you have not left a five star rating our review please do so. It helps get the word out. There are people searching for us in Itunes and Google Play and when they see that five star rating they are more prone to quickly hit subscribe and start listening to these marketing automation as you have been. A big thank you to all of the listeners who are providing feedback [00:46:30] and constructive criticism. I can’t thank you enough. It’s because of you that the podcast is growing and getting better every day. This the ActiveCampaign podcast. The small business podcast to help you scale and propel your business with marketing automation. I’ll see you on the next episode.